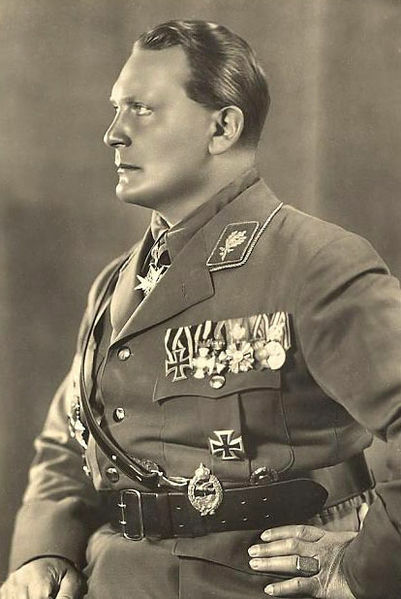 Today is the anniversary of the April 26, 1938 decree by Goering requiring Jews to declare their property. It is important that any student of the Holocaust read the text of the decree, reproduced in italics below. There is very little written about this law, which was a critical turning point in the Nazis' adoption of the Final Solution. First robbery, then murder of the despoiled victims. Today, the consequences of this law are still being litigated in the United States. US museums are successfully clinging to artworks stolen pursuant to the April 26, 1938 decree and the subsequent measures. The Jewish Property Declarations were sealed by Austria from 1945 until 1993. Now US museums are suing Jewish descendants of Holocaust victims to "quiet title" to the artworks in their collections, in violation of international law and the United States' commitment to return Nazi spoils to their victims. 2. The duty to report holds likewise for the non-Jewish marital partner of a Jew. 3. Every reporting person's property must be given separately. 1. Property in the sense of this law includes the total property of the person required to report, irrespective of whether it is exempt from any form of taxation or not. 2. It does not include movable objects used by the individual or house furnishings as far as the latter are not luxury objects. 1. Every part of the property shall be valued according to the usual valuation it has on the effective date of this regulation. 2. No report is necessary when the total worth of the property to be reported does not exceed 5000 marks. The report is to be presented on an official form by 20 June 1938, to the administrative official responsible at the place of residence of the reporting individual. When such a report is not possible by this date the responsible official can extend the period. In such case, however, an estimate is to be presented by 30 June 1938, together with a statement of the grounds of delay. 1. The reporting individual must report, after this decree goes into force, to the responsible office, every change of said individual's total property as far as it exceeds a proper standard of living or normal business transactions. 2. The reporting requirement applies also to those .Jews who were not required to report on the effective date of this regulation but who have acquired property exceeding 5000 Reichsmarks in value, after this date. Article 1 (1) clause 2, shall apply respectively. 1. The administrative offices responsible under this reguhttlon are in Prussia-Highest Administrative Officer [Reierungspraesident] (in Berlin the Police President) ; Bavalria Administrative Officer [Regierungspraesident] ; Saxony---Tivoli District Head [Kreishauptmann]; Wurtemberg-The Minister of the Interior; Baden-The Minister of the Interior; ThueringenReich Governor [Reichsstatthalter]; Hessen-Reich Governor; Hamburg-Reich Governor; Mecklenburg-Ministry of the State, Interior Department; Oldenburg-Minister of Interi01•; Braunschweig- Ministry of Interior; Bremen-Senator for Administration of Interior; Anhalt-Ministry of State Interior Department; Lippe-Reich Governor (Land Government); SchaumburgLippe-Land Government; Saarland-The Reich Commissioner for the Saar. 2. Austria-The Reich Governor has jurisdiction. He may transfer his authority to another board. The Deputy for the Four Year Plan is empowered to take such necessary measures as may be necessary to guarantee the use of the reported property in accord with the necessities of German economy. 1. Whoever wilfully or negligently fails to comply with this reporting requirement, either by omitting it, or making it incorrectly, or not within the time specified, or whoever acts contrary to any instruction issued pursuant to Article 7 by the Deputy of the Four Year Plan shall be punishable by imprisonment and by a fine or by both of these penalties, in particularly flagrant cases of wilful violation the offender may be condemned to hard labor up to ten years. The offender is punishable notwithstanding that the action was in a foreign country. 2. Any attempt to commit such actions is punishable. 3. In addition to the imposition of the penalties under (1), the property may be confiscated, insofar as it was involved in the criminal action. In addition to hard labor confiscation may be made. Where no specific individual can be prosecuted or convicted, confiscation may be decreed independently, where the prerequisites for confiscation warrant it. 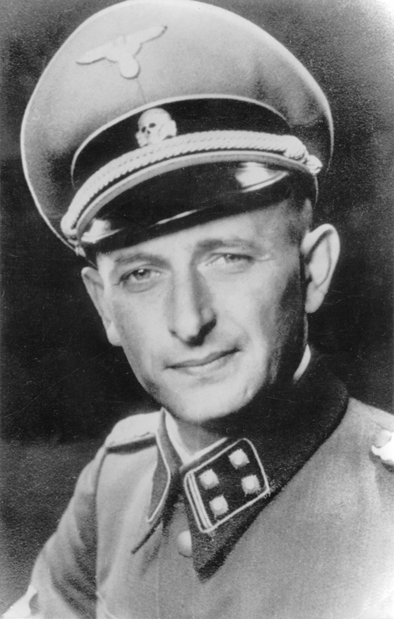 Adolph Eichmann set up the Zentralstelle in Vienna in August 1938. He described it as a "conveyor belt". You put a Jew and his property on one end and the Jew emerged with a passport and no property on the other end. Eichmann is considered the "father" of spoliation for profit and the creation of the "Vienna model" of despoiling Jews before exporting them or murdering them. The problem arose that no country wanted to accept Jews that had been completely spoliated. Murder thus became the next logical step. More information on Bakalar v Vavra, a recent Second Circuit case interpreting the April 26, 1938 Jewish Property declaration decree here. More on Austria's violations of the Austrian State Treaty here. 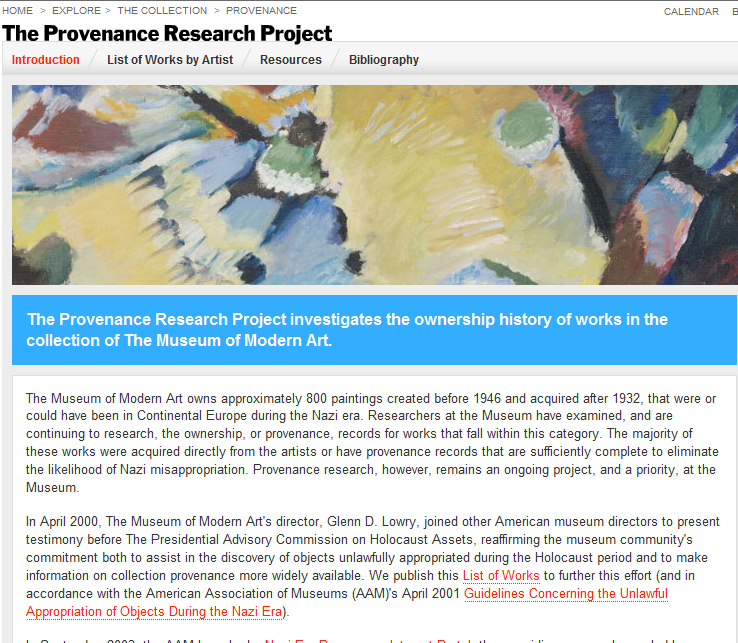 A report on how the Museum of Modern Art in New York is the largest repository in the nation of Nazi looted art coming in through Switzerland here. Historian Richard Evans' thoughtful piece on art looting in wartime. 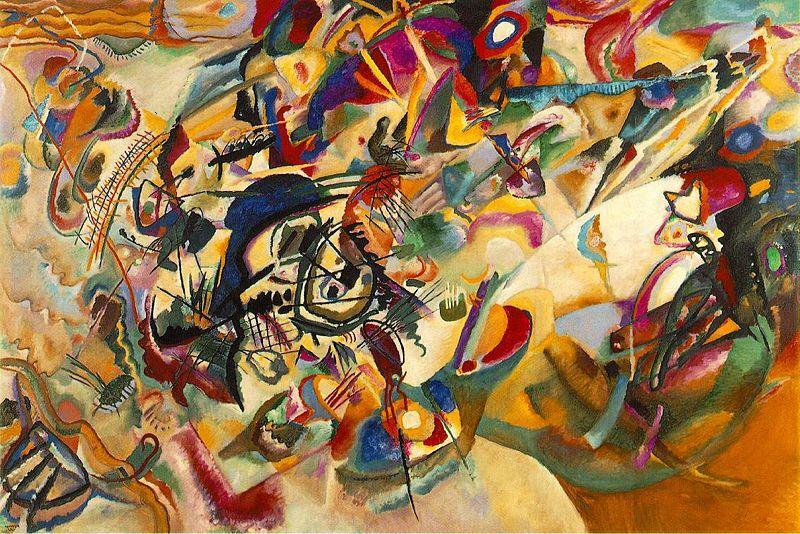 It is not surprising that one of the leading scholar of Germany in World War II would turn his attention to art. Fair Use Fridays: Fair Use Is A "Bit of a Loophole For Students and Teachers"
Another horrifically bad and misleading copyright video aimed at children. It doesn't mention the US Constitution. It doesn't reference the First Amendment. It refers to fair use as "a bit of a loophole for students and teachers". This one gets a D-. It at least mentions the public domain, a concept left out of a number of the other copyright educational videos. More botched fair use education by YouTube here. Some hope from a copyright librarian here. 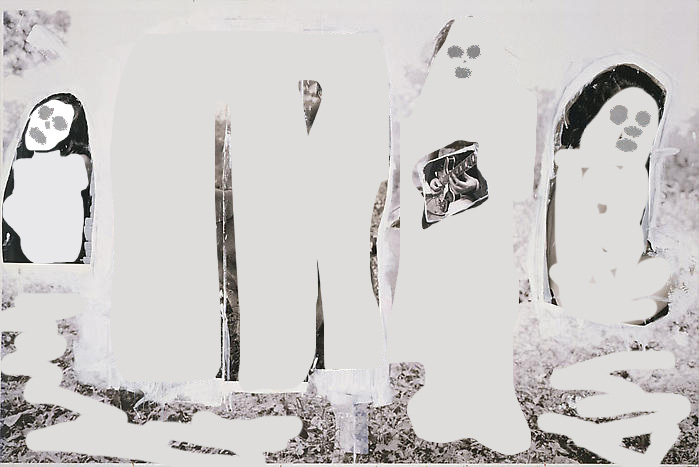 Fair Use Fridays: Richard Prince Redux: Can Appropriation Art Be Stolen? Or De-Appropriated With An Eraser? 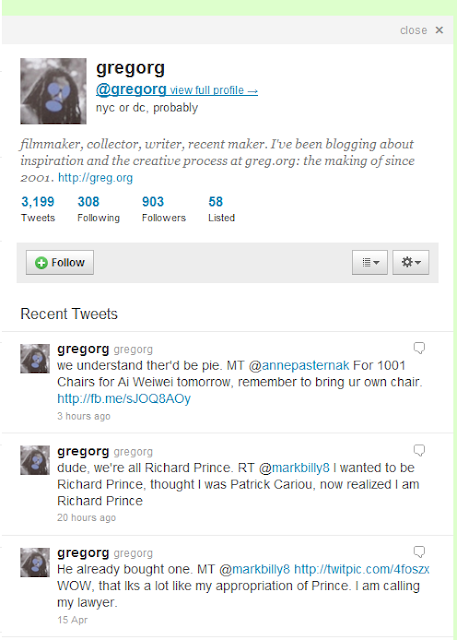 Gregorg is calling his lawyer because someone is stealing his Richard Prince appropriation. Cat Weaver's Garden Sans Cariou. Stealing the stolen stuff out of a thief's misappropriation? Full story on Hyperallergic here. My take on Cariou v Prince here and here. Software manufacturers usually try to block consumers from modifying or improving their products. This is anticompetitive conduct. Microsoft started out by first blocking hackers on its new Kinect 3d camera, and now it is encouraging them. Story and more hacks on Mashable here. When software encryption stands in the way of innovation, progress favors hackers who promote product improvement and adoption. It is distressing when copyright owners abuse the monopoly granted by copyright to discourage progress and it is good to see Microsoft embracing change. Copyright is combined with contract law to defeat the first sale doctrine in an anticompetitive manner. The Kinect technology has so many potential applications, particularly to assist the disabled. Reverse engineering is addressed by the Digital Millenium Copyright Act 17 USC 1201(f). A good summary of the state of the law from EFF here. Scary video from University of Southern California Institute of Creative Technologies showing how the Kinect hack will cure childhood obesity and diabetes by exercising kids while they are glued to a television screen for six hours a day. More on Primesense cameras here. Courtesy Boing Boing, Lady Gaga refused to let Weird Al make a parody of her song with proceeds to charity, so he claimed fair use and released it anyway. Maybe Weird Al can get hired at YouTube's Copyright School to put the First Amendment into the curriculum? More on parody here. Boing boing's analysis here. A good illustration of how consecutive and simultaneous translation work in the courtroom setting, and an exercise to illustrate how difficult it is. Conducting an effective direct or cross-examination of a witness who speaks a foreign language is difficult, even for the best trial lawyer. If the interpreter is not top-shelf, it can be disastrous. Advance preparation is essential, preserving objections and ensuring a clear transcript is essential. If possible, have someone on your team who speaks the language: preserve your objections to mistranslations immediately or they will be waived. If you are reading this post directly from my blog, my avatar should appear - slowly to the right side of this post. When a photographer takes your portrait, the photographer owns a copyright in the photograph. But can the photographer use your image in advertising without your permission? I created the avatar from a photograph and a voice recording and it will live until I kill it. Or not. I have posted an image (a bad one) of the avatar below for future generations, since I will probably kill the talking one soon. It's a great novelty, but my execution is pretty amateurish and I am not entirely sure that it completely fits the Copyright Litigation Blog's overall tone. For those future generations who aren't treated to the live-action version, my avatar's eyes move around and follow your cursor after I stop talking (the recording ends). If you leave the blog on the screen for a bit, you will see my eyes continue to follow your cursor around. 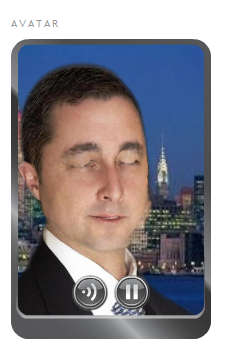 During the sound recording, the avatar mimics my speech, moves its lips, eyes and head in an odd photorealistic way. One Copyright Litigation Blog fan described it as "creepy". I recorded a few messages, so you can listen more than once. Technology will soon improve the 3d quality and the service would have worked better if I had a portrait where I was looking straight ahead. This is an attempt to make a 3d from a 2d photograph. Soon 3d will be here. "Rights of publicity" or "rights of privacy" protects the name, likeness, voice and image of a person. As my avatar makes clear, such rights will become increasingly valuable in the virtual world, it will become easier to commit identity theft and impersonate living individuals - or replace them. These rights are regulated by state, not federal law. Remember, wait a bit. Then move your cursor around, my avatar's eyes will follow you. More on rights of publicity here and here. A great talk by Nancy Sims, a copyright librarian from the University of Minnesota here. A+ on copyright law for Nancy Sims. My take on YouTube's failure here. Nancy's very very smart survey will surprise many. Her discussions of responsible fair use and giving in to fear are really thoughtful. In ATPAC Inc. v. Aptitude Solutions, Inc., (EDCA April 12, 2011), the court considered the issue of whether computer source code that had been registered with the copyright office could be considered a trade secret. Plaintiff ATPAC creates software and imaging solutions for county clerks. Under Section 301 of the Copyright Act, any state law claims that are "equivalent" to copyright are preempted by federal law. Under the preemption doctrine, if a claim brought under state law is brought that is "equivalent" to a right or remedy under the Copyright Act, it fails. Thus court look at state law claims and analyze them to see whether the claim adds an "extra element". If so, it may survive a preemption challenge. In ATPAC, the plaintiff had registered its source code with the copyright office in such a manner as to keep it confidential. This is a special procedure designed to preserve computer code as a potential trade secret. On a summary judgment motion, the district court permitted the "misappropriation of trade secrets" claim to survive because the "extra element" of the plaintiff preserving the secrecy of the trade secrets is qualitatively different from mere copyright infringement and its application would not conflict with copyright law. In Chapter 10 of Copyright Litigation Handbook, Removal from State Court and Preemption, I cover the preemption doctrine and how it can be used to remove proceedings from state to federal court. More on the ATPAC suit here and here. More on trade secrets here. In this video of a speech from the ABA Techshow, Professor Lawrence Lessig has put together a powerful political manifesto for those wishing to deregulate culture. He points out how internet code has created new artistic norms, abilities to speak and communicate through video and music that are being marginalized, stifled and criminalized without regard to the First Amendment. He joins a thoughtful, enjoyable legal and historical analysis of the internet, of the interaction of law, norms, market and architecture on human behavior and the problems we face with a plan to reduce the impact of big money on Congress. Watch the video, he can't be accused of thinking small. His Manichean vision of Congress and the current state of big money influencing Congress (Lessig seeks to "kill off the bad" and "strike evil") is pure Ralph Nader. About money and Congress, Nader was right, Lessig is right. This video, and Lessig's ideas, are tremendously important. Whether we need a new Messiah to smite evil is a different story. Money is corrupting our democracy. Our country's founders intended our government to be dependent upon the people alone—but today, lawmakers spend up to 70% of their time raising money for their reelection campaigns. In 2010, it cost an average of $8.5 million to win a Senate seat. Barack Obama is expected to spend over $1 billion on his reelection campaign. Where do we think this money comes from? Thoreau wrote, "There are a thousand hacking at the branches of evil to one who is striking at the root." The root of our political evils is money. Our goal is to build a network of rootstrikers—to talk about this issue, clearly identify the problem, and work together towards practical reforms. Rootstrikers is a project of Fix Congress First, a nonprofit organization founded in 2008 by Lawrence Lessig and Joe Trippi to fight the corrupting influence of money in politics. Joe Trippi is one of the most sought-after political strategists and an enduring figure on the presidential campaign circuit. He worked for Ted Kennedy, Walter Mondale and Gary Hart and turned Howard Dean into an unlikely front runner in 2004. A former Silicon Valley consultant, Trippi was the first political operative to appreciate and then realize the potential of the internet, and as such the strategy, tactics and tools he created in 2004 have become the foundation for many of today\'s most successful campaigns. So the guy who created Howard Dean is going to combat the evils of money in politics? Presumably if I send him some evil money? Lessig's core thesis of deregulating culture is a powerful one. But when he moves off message to Wikileaks and politics, the polish wears thin. I am not so sure that Wikileaks really brought democracy to the Middle East, but I am in agreement that our expenditures on foreign expeditionary wars cloaked in democratic rhetoric are a collosal waste of money. Lessig ought to lighten up on the combating evil stuff, be a bit more nuanced and tighten his focus to win on the ground where he is strong: criminalization of creativity. It's kind of tough to save culture AND end wars at the same time, standing next to a guy bragging that he was Howard Dean's internet bag man. It wouldn't be the first time an idealistic young crusader went to Washington, was used by the establishment, had his pockets emptied and idealism shattered. Lessig is correct that deregulation of copyright law is a sensible and reasonable thing. But it's not enough to be right. Coalition-building, consensus and compromise are not necessarily dirty words and people who don't agree with you are not necessarily evil or insane. Even if they are dead wrong. Again, watch the speech, he is a brilliant thinker and his message is important. Thanks to Cyberlaw Central for bringing the Lessig speech up, Kevin Thompson's take here. More on Remix culture here. My review of Lessig's book Remix. 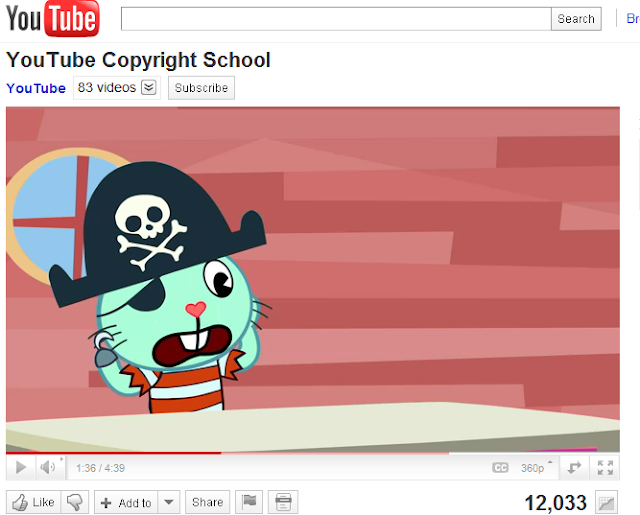 I posted Friday on how YouTube's Copyright School propaganda video flunks copyright law here. Now the Wall Street Journal posts a video where one journalist interviews another journalist about copyright law (below). According to the "journalist" interviewee, YouTube has posted the video because it just wants to communicate that "copyright law is pretty complicated" and wants everyone to be "as educated as possible." Sorry, but journalists working for the same company interviewing each other is not journalism, it's just fakery. On top of that, they have misunderstood what this video is and what its effect will be. WSJ "reporters" Lauren Rudser and Jennifer Valentino-DeVries have now flunked both journalism school and copyright school. More on ethics in journalism requiring truthfulness, accuracy and objectivity here. Fair Use Fridays: Publishers Sue Universities Over "E-Reserves"
From Ars Technica, a fair use kerfluffle here. According to Zeropaid's piece here, accused copyright infringers on YouTube will have to attend YouTube Copyright School, which involves watching a video and taking a quiz. Why doesn't YouTube's video mention the public domain? Watch the video and you will see a child-like figure being smashed with a gavel over the head for purported copyright infringement. It is disturbing to see that YouTube is indoctrinating children into fear of quoting materials by authors living and dead by showing images of corporal punishment meted out by judges. According to the video, if you are not sure what fair use is, you must consult a copyright lawyer. Of course all children have copyright lawyers, so that is a workable solution. YouTube's video doesn't mention copyright law's grounding in the US Constitution, nor the purpose of copyright law. YouTube's video fails my copyright school. More on the fair use doctrine. An unintentionally terrifying Copyright PSA. Zombified children, unintentionally hilarious "fair use" mistakes - I thought it was a spoof, but... this video really shows how misunderstood the fair use doctrine is... by someone purporting to teach it. but using the zombified kids is really Jonestown Massacre. Pass the KoolAid. Arthur Danto wrote of Kazimir Malevich's Black﻿ Square: "We marvel at its originality, not its painterly brilliance." A great video on the Gagosian website with curator Andrea Crane introducing the work of Malevich and its influence on American artists such as Richard Serra is found here. The show at Gagosian called "Malevich and the American Legacy" is wonderful, I was fortunate to have a guided tour. Andrea Crane quotes (I paraphrase) MoMA founder Alfred Barr as saying "Each generation needs recreate its own Black Square." Copyright does not protect simple geometric shapes like squares. That does not stop the art world from finding freshness, originality and tremendous value in works such as Black Square. Which should give us all time to pause and reflect on the meaning of ownership, of originality, and of inspirational conversations had among past, present and future artists. Images from the show here. The show closes April 30, 2011. Some cases discussing copyright law's originality requirement here and here. The US Supreme Court required originality and rejected the "sweat of the brow" doctrine in Feist v. Rural, a case involving litigation over telephone books. Great essay in University of Pennsylvania's PENNumbra Guarding the Historical Record from the Nazi-Era Art Litigation Tumbling Toward The Supreme Court here. Highly critical of the Museum of Modern Art. A truly astonishing interview with law professor Jennifer Kreder on Illinois Public Radio here. Great interview with law professor Jennifer Kreder on Illinois Public Radio on artworks looted by the Nazis that are now in US museums that were smuggled into the US through Switzerland. Get the shocking story here. 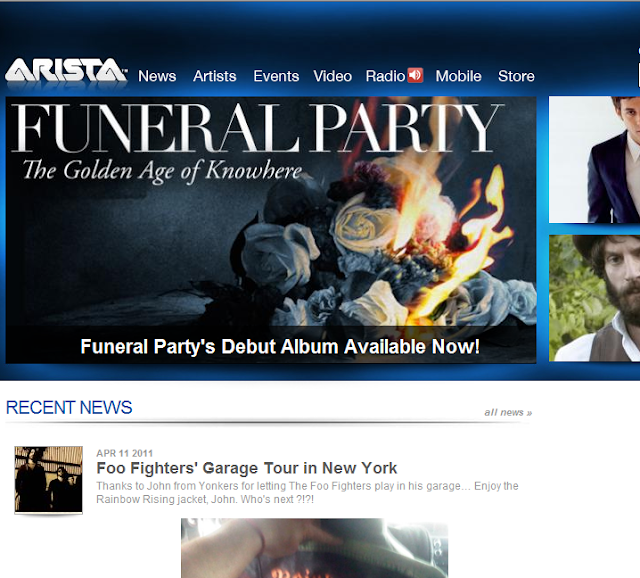 Arista Records - Throwing a Funeral Party Over Lime Wire? Arista Records LLC et a. v. Lime Group LLC (Lime Wire) (06 CV 5936) has recently spawned a series of decisions of interest for those who follow the Copyright Act's provisions on statutory damages. More posts on statutory damages here. Right now the First Circuit is deciding the Tenenbaum case which includes a challenge to an award of statutory damages against a student downloader. More on Tenenbaum here and here. But in the Lime Wire case (background here), Judge Kimba Wood granted summary judgment on May 11, 2010 finding Lime Wire liable as a secondary infringer for running a service that facilitates peer-to-peer file sharing, full decision here. An interesting aspect of the case is that Lime Wire's founder was held to be personally liable. But following Judge Wood's grant of summary judgment, a recent flurry of decisions relating to the Copyright Act's statutory damages provisions, 17 USC 504(c) have emerged. In Chapter 17 of Copyright Litigation Handbook (West 2010), I cover issues relating to damages under the Copyright Act. Chapter 18 covers the related issues of costs and attorneys fees. On March 10, 2011, Judge Wood considered the issue of whether Lime Wire, a secondary infringer, was liable for multiple awards of statutory damages for each copyrighted work it permitted to be infringed, or only one. Analyzing the provisions of 17 USC 504(c) and its legislative history, Judge Wood found that the record companies could only recover from Lime Wire one statutory damages award for each copyrighted work infringed. The decision is worth the read, find it here. But how does one prove ownership and infringement of 11,000 plus works? And how do you prove that each owner owned it at the time the work was infringed? Judge Wood's decision of March 29, 2011 is here. Review each category, and you have a neat primer on how to prove copyright ownership in a variety of contexts. 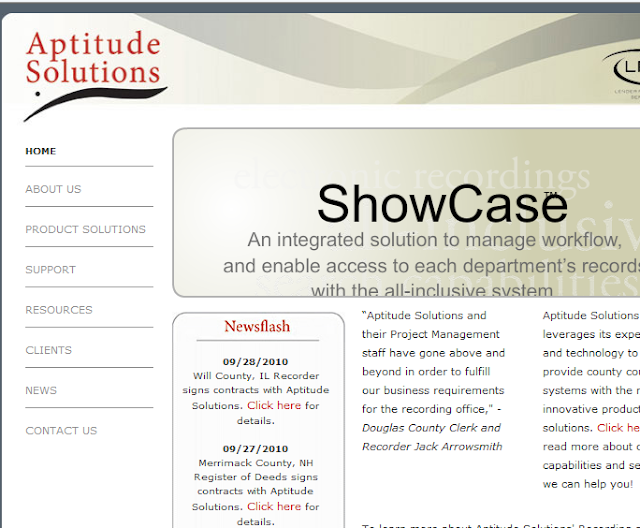 A unique angle is that Plaintiffs hired private investigators in 2010 to illegally download one of each of the works. Defendants challenged the "timing" of ownership. Judge Wood granted summary judgment on ownership, since that was essentially unchallenged by the evidence. Practice Tip: Judge Wood points to the Second Circuit's case law showing that if a litigant challenges evidence submitted on a summary judgment motion, the proper remedy is a motion to strike the evidence. On April 4, 2011, Judge Wood looked at the question of whether a statutory damages award was available for each song, or for each sound recording (an album is one sound recording and ordinarily supports only one statutory damages award). Judge Wood's decision here. Judge Wood ruled that if infringements of individual songs could be shown prior to release of the album, statutory damages awards would be available for infringements of those individual songs. On April 6, 2011, Judge Wood considered the question of whether Lime Wire was "off the hook" as a secondary infringer where the record companies had already obtained judgments against primary infringers. Judge Wood's answer: "no". The damages trial is scheduled for May 2, 2011. Fair Use Fridays: What do you do with a drunken sailor? Labels: copyright infringement, copyright law, fair use doctrine, irish rovers, johny depp, music piracy, what do you do with a drunken sailor? By hiring from a list of approved "clearance counsel": Michael C. Donaldson and Lincoln Bandlow of Los Angeles; Anthony Falzone of the Fair Use Project at Stanford Law School; F. Robert Stein and Stephen Sheppard of New York; and Dan Satorius of Minneapolis, documentary filmmakers can buy fair use insurance from Chubb covering usage of unlicensed film clips. Story from the International Documentary Association here. More on 17 USC 107, copyright law's fair use doctrine here. In Hollander v. Steinberg, (10-1140 cv April 5, 2011), the Second Circuit applied the fair use doctrine, 17 USC 107 to filings in judicial proceedings. An author claimed that his essays were unpublished and that his adversary filing them in their entirety in a judicial proceeding was copyright infringement. The decision is a "Summary Order" which under Second Circuit rules is not supposed to have any precedential value, but which may now be cited under Federal Rule of Appellate Procedure 32.1 and the Second Circuit's Local Rule 32.1.1. A "Summary Order" is proper when the panel believes that a decison should have "no jurisprudential effect". Issuance of summary orders is controversial, since our system of case law is based on precedent, not on the subjective belief of judges that their opinions ought to be ignored. The Federal Courts Committee believes that this complete prohibition on the citation of summary orders does not serve the interests of justice or judicial economy. The pervasive use of summary orders has created a vast body of unpublished decisions which are often pertinent to issues arising before the Court, but which cannot be brought to the Court's attention under the current rule. The Committee is aware of cases where the Court has previously ruled by summary order on the precise contention being made in a pending case, on indistinguishable facts, and of other cases where a summary order may be the only authority on point. Of particular note in Hollander is that a copyright owner's market for a work would not be destroyed by publication of the work on the court's PACER system because retrieving it from PACER is cumbersome. Finally, the fourth factor, “the effect of the use upon the potential market for or value of the copyrighted work,” 17 U.S.C. § 107(4), clearly favors Steinberg. With this factor, “[t]he focus . . . is on whether defendants are offering a market substitute for the original.” NXIVM Corp. v. Ross Inst., 364 F.3d 471, 481 (2d Cir. 2004). “[O]ur concern is not whether the secondary use suppresses or even destroys the market for the original work or its potential derivatives, but whether the secondary use usurps the market of the original work.” Id. Should Den Hollander offer his essays for sale, it is highly unlikely that potentially interested readers would even be aware of the essays’ presence in a court file, let alone choose to acquire copies by the cumbersome methods of visiting a courthouse to make copies or using PACER. And in any event, Den Hollander has offered no evidence that Steinberg “usurped the market” for the essays by submitting them as exhibits in judicial proceedings. So we have in Hollander a fair use decision that the Second Circuit has decided should be ignored. More on the fair use doctrine here. Fair Use Fridays: "Most Copyright Holders Have Never Heard of Fair Use"
From "Clip Show - A Practical Guide to Fair Use"
After the film has been released, expect to get calls from copyright holders upset about your use of their footage. Most copyright holders have never heard of Fair Use, and you should allow some money in your budget to have your attorney call and talk through the evidence you have. If you have been responsible in your Fair Use decisions, most complaints will only require one phone call from your attorney to make them go away. We encountered a handful of copyright holders from some very large corporations who were not pleased that their clips had been used in our film, but we were well prepared by our attorneys and had no problem avoiding any legal claims. 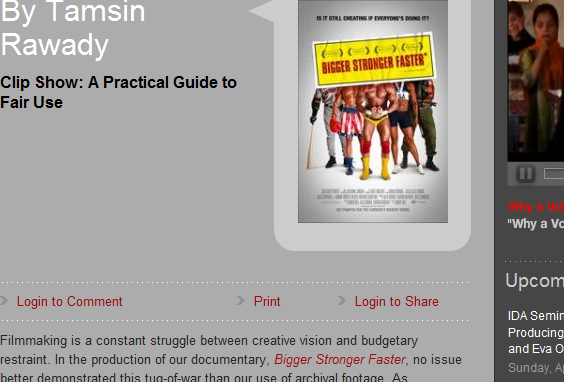 Full story from the maker of Bigger Stronger Faster here. Watch the film here. Not sure what the public service is exactly, but this is certainly a creative interpretation of copyright law's fair use doctrine. 17 USC 107. More on copyright law's fair use doctrine here. Fair Use Fridays: Copyright PSA for the Users: Sing Along! A video by Michael RobbGrieco showing copyright from a copyleft perspective. The video contains a singalong critique of "overstated" owner's rights illustrating a view of the fair use doctrine 17 USC 107. Isn't that the Twitter bird they are painting? There are a lot of interesting Twitter lists. A Twitter list is interesting because you are interested in the person who compiles the list and what they like, because you find the topic of the list interesting, or both. Compiled below by Twitter address, then by topic if they are listed. The essential tutorial on how to use Twitter lists by Mashable here. Twitter lists are great for lurkers, since you don't have to follow. 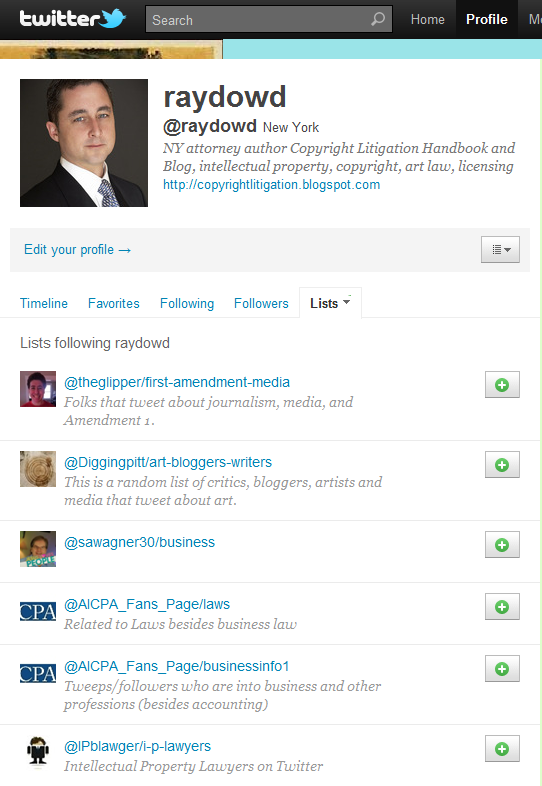 Copyright Litigation Blog listers who follow @raydowd are clearly a discerning group - check out the lists following Copyright Litigation Blog, and thanks for the listings! Open source, intellectual property, art and new media. 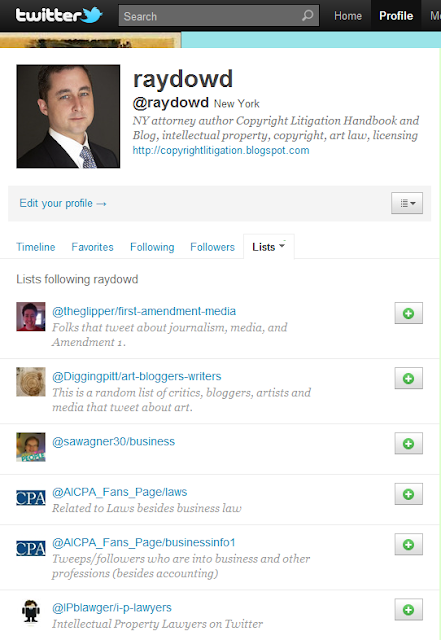 For top copyright law influencers on Twitter from Twitalyzer, go here. Top 50 copyright blogs of all time here. Top IP lawyers on Twitter here. 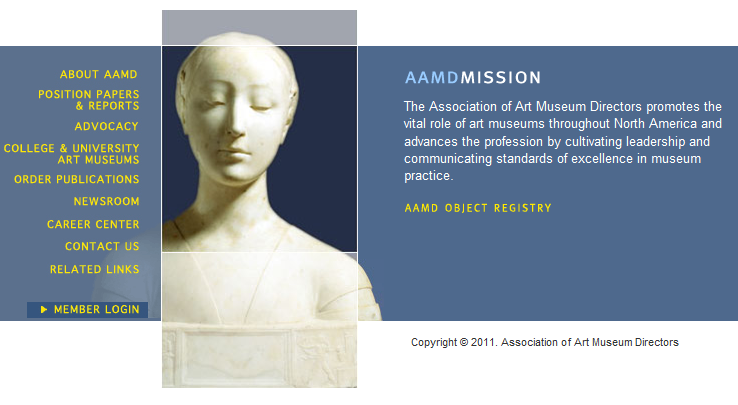 The Association of Art Museum Directors has issued a fair use policy. According to them ,working with low quality digital thumbnails is fair use. Full policy here. More fair use guidelines here. Section 107 of the Copyright Act embodies the fair use doctrine. 17 USC 107. More on the fair use doctrine here. 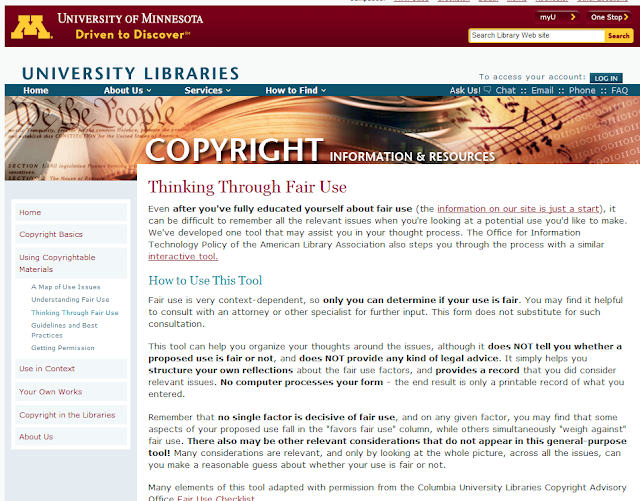 University of Minnesota has created a fair use bot to assist potential fair users in understanding the fair use doctrine embodied in 17 USC 107. Once you have "fully educated" yourself about fair use, using the bot will help users "structure" their reflections. It also looks like the maker is permitting a paper trail to be created to defend a potential use. I admire the thought and effort that went into putting the bot together and look forward to giving it a try. It is a worthwhile exercise. But given the schizophrenic the state of the case law interpreting the fair use doctrine, I am afraid that users will get back only the answers they seek.